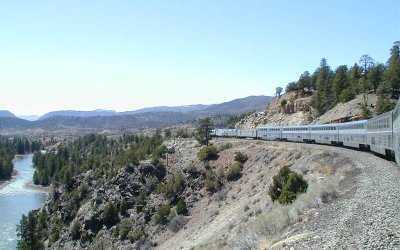 It's April 19, 2002, and the California Zephyr is rolling besides the Colorado River on its way to Glenwood Canyon, Grand Junction and beyond. My train was filled with a true and happy cross-section of America, lucky to have attentive service, truly excellent food and some of the world's best scenery. Sure, budget cuts have frayed some edges and sea sick pills should be handed out before hitting the god-awful BNSF line through Iowa and Nebraska -- were I a shipper I'd certainly not turn my freight over to that company and were I Amtrak I'd try to find a different route -- but at the end of the day this is a magnificent trip. The CZ should be protected as a national treasure and assured the spit and polish it deserves. It's a cold Saturday in February 2002. Harrison, New Jersey, is just a minute or two north of Newark's Penn Station. Located on the PATH line to Hoboken and Manhattan, it is one of the best places in the Northeast to do railroad photography. On the left are New Jersey Transit Trains coming and going up and down the NE Corridor. 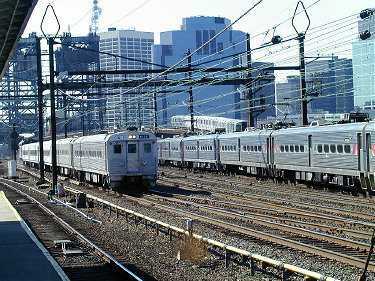 In the background is a PATH training heading from Harrison to Penn Station Newark. 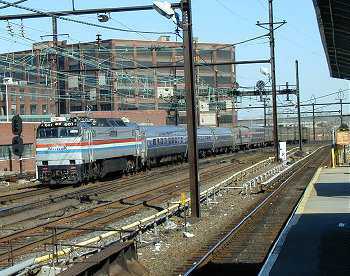 On the right is Amtrak's Three Rivers, on its way to Pittsburgh and Chicago. Here you have it all. Corridor busy with Amtrak and NJ Transit trains it runs, a connecting subway system offering gateway service to the Big Apple. One can only imagine the chaos and dislocations caused if any part of this integrated network goes down thanks to an ideological political agenda. Windsor Locks, Connecticut, July 2001. Train 142 is arriving from Washington, New York, New Haven, Hartford and intermediate stations on its way to Springfield, Worcester and Boston. The handsome Genesis is hauling conventional Amfleets, including a nicely redone cafe-lounge car. 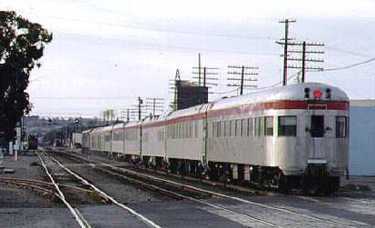 We can only hope that in his effort to fix the Acela marketing fiasco David Gunn sands off the fading pea green Amfleet color scheme and gets us a couple of more trains on a route that could easy link up to Portland and take advantage of new Worcester line MBTA services. Oh, and what about hooking up Nova Scotia!!! 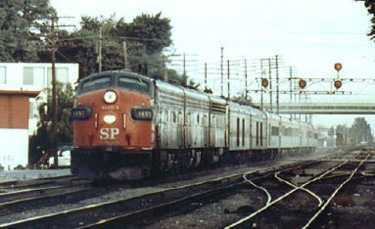 The best thing that could be said about SP's Coast Daylight in 1967 is that it was still running. Gone is the dome-lounge and diner, replaced by an automatic buffet car, a commonly despised piece of penny-wise pound-foolish equipment that mocked the railroad's once fine service on this train. Those wanting better could take the overnight Lark, but very soon it would be discontinued. Here's the Daylight in Redwood City, heading north to San Francisco. 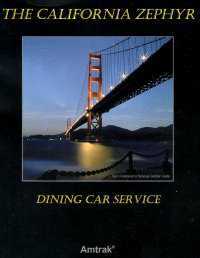 It did, unlike today's Coast Starlight, tend to run on time, and with direct access to the City By the Bay, permit arrival for a civilized repast -- doubtless quite welcome after a bout with the Horn and Hardart on Wheels and, as widely reported, a tee-totaler's drink selection. I'll take the Starlight any time. For Ron's trip report on Amtrak's Coast Starlight please CLICK HERE. Changes last made on: July 31, 2002.